Born in Chester County, Pennsylvania, Thomas McKean was the son of Letitia Finney and William McKean, innkeeper and farmer. He was educated at Francis Alison‘s New London Academy and then studied law with his cousin, David Finney of New Castle, Delaware. After being admitted to the Delaware Bar in 1754, he practiced law also in Pennsylvania and New Jersey before being admitted to the Society of the Middle Temple in London in 1758. Ambitious and able, McKean soon became active in Delaware politics. He became deputy prothonotary and recorder for the probate of wills in New Castle County (1752), deputy attorney general (1756), justice of the peace (1765), and collector of customs for New Castle (1771). He was elected to the Delaware legislature in 1762, serving until 1779, with two stints as speaker, in 1772 and 1777. When opposition arose to English policies, he represented Delaware at the 1765 Stamp Act Congress and helped organize Delaware’s resistance to the Townshend Duties. During the Revolutionary years of 1774 to 1783, he served not only as speaker of the Delaware Assembly, but also as Delaware representative to the Continental Congress, signing the Declaration of Independence and Articles of Confederation and briefly acting as the congress’ president. It was McKean who argued successfully in Delaware for the suspension of the proprietary government in 1776. He also acted very briefly as president of the state in the fall of 1777. In 1774, McKean moved to Philadelphia to further his legal practice and also to facilitate his involvement in the independence movement as a member of the Continental Congress and otherwise. As McKean, an early proponent of the radical position in favor of independence, entered into Pennsylvania politics, he continued to hold political offices in Delaware. He became a colonel of Philadelphia’s Fourth Battalion of Associators and president of the 1776 Pennsylvania Provincial Conference called to lay the groundwork for a state constitutional convention. McKean played an important role in the writing of state constitutions for both Delaware and Pennsylvania (although he was very critical of Pennsylvania’s first state constitution). In July of 1777 McKean began his twenty-two years on the Pennsylvania Supreme Court, steering a moderate course and, with James Wilson, working for the successful 1787 ratification of the federal Constitution. In the Pennsylvania constitutional convention (1789-1790), McKean played an important role in the creation of a new, more conservative state constitution for Pennsylvania. After 1790 he was a foe of Alexander Hamilton’s Federalist financial policies and a proponent of the state’s Republican party. As a Republican, he was elected governor of Pennsylvania in 1799. His three terms as governor were often controversial, especially his introduction of the spoils system to replace Federalist office holders with Republicans, and then later to replace Republican foes with Federalists. Thomas McKean married Mary Borden in 1763, and after Mary Borden’s death, Sarah Armitage in 1774. He had a total of eleven children from these two marriages. His son Joseph Borden McKean, who attended the Academy of Philadelphia and graduated from the University of the State of Pennsylvania in 1782, served as trustee from 1794 to 1826; father and son served together on Penn’s Board of Trustees for more than twenty years. McKean was a founder of the Hibernian Society and a member of the Society for the Promotion of Agriculture, the American Philosophical Society, and the Order of the Cincinnati. He was also a sponsor of the New London Academy and a trustee of both the Newark (Delaware) Academy and the University of Pennsylvania. 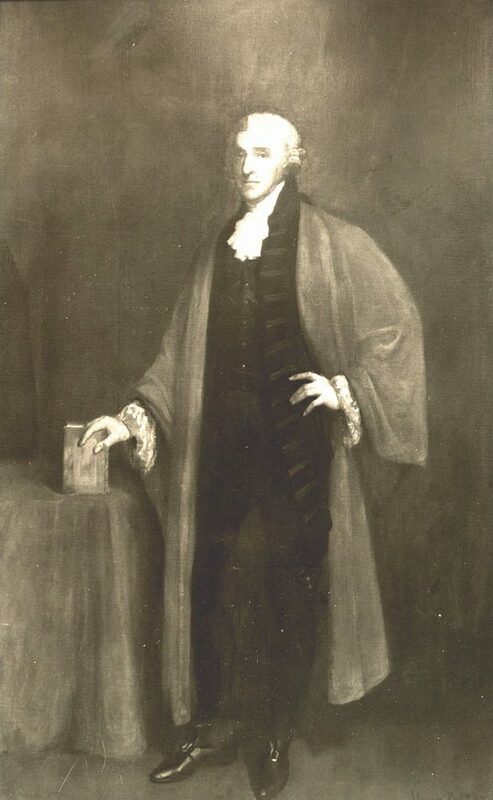 As Chief Justice of the Pennsylvania Supreme Court and as governor, McKean served from 1777 to 1791 as an ex officio member of the Board of Trustees of the University of the State of Pennsylvania (now the University of Pennsylvania). He held the position of board president during his term as governor. After that time he continued as an elected trustee of the University of Pennsylvania (created by the 1791 union of the College of Philadelphia and the University of the State of Pennsylvania) until his death in 1817.